The EFM (Electronic Flow Meter) Emerson ROC module is a protocol driver for the Ignition OPC UA module, by Inductive Automation. It communicates with Emerson ROC and ROC Plus flow computers, formerly Fisher ROC. This includes, but not limited to, FloBoss 100 Series and ROC 800 series. 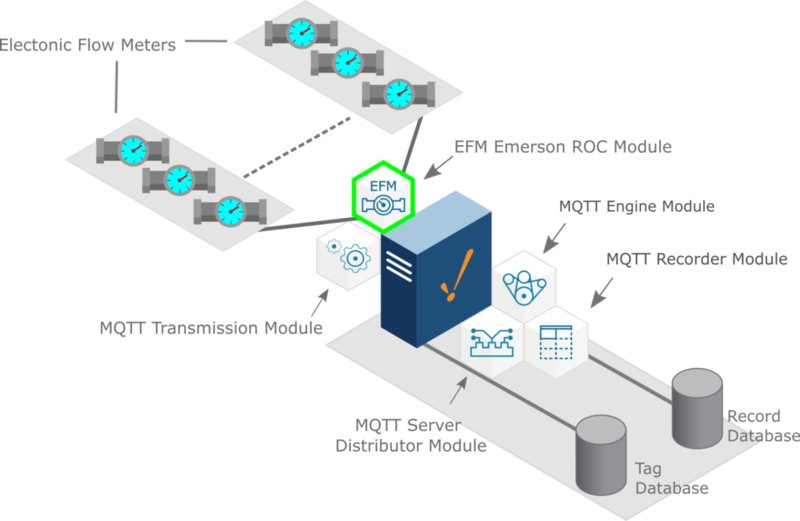 By using the EFM Emerson ROC Module on the Ignition platform the Emerson ROC EFM data is polled and made available as tags within the OPC browser. EFM Emerson ROC Module uses T,L,P addresses to access data from standard and custom applications running on the flow computer. 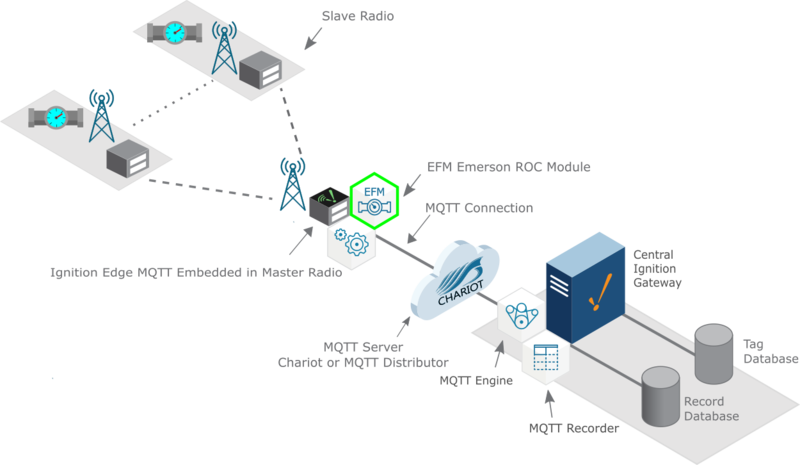 With the ability to load custom TLP libraries into the protocol module, custom configurations can be created and quickly replicated across entire populations of deployed devices. By coupling the EFM Emerson Protocol with the power of the MQTT modules by Cirrus Link the real power of this solution can be realized. By installing Ignition or Ignition Edge with the EFM Emerson ROC polling is distributed to the edge and increase bandwidth utilization over radio or other IP networks providing increased response times of SCADA data. Please find below the typical architecture solutions when using the EFM Emerson ROC Module. 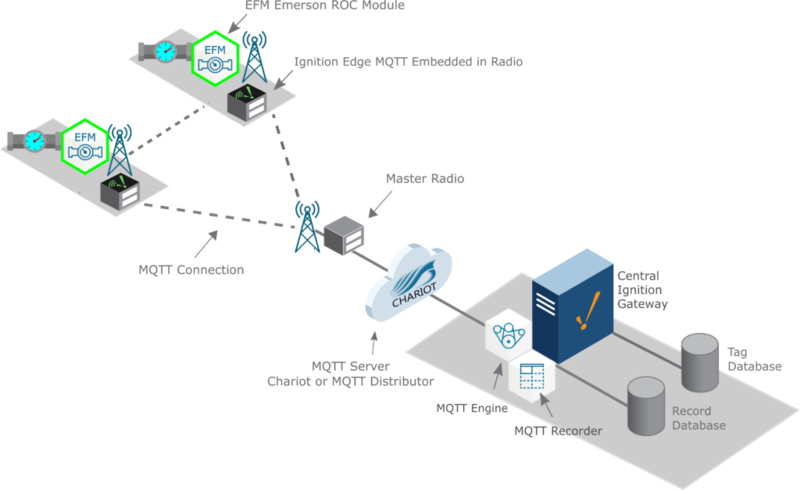 Using the highly efficient MQTT protocol only event changes are transmitted to the host. The benefit this gives is that the real time SCADA data is transmitted on change, while continuously monitoring for Alarms, Events and QTR records to be sent only when available. For years complex sets of registers have been used in legacy protocols to send data that is essentially a record of information. These methods are prone to problems with keeping the data together and require a lot of polling from a SCADA host over the network to monitor for new events. With the EFM Emerson Protocol module data such as Alarms, Events and QTR’s are extracted from the flow computer and put into an MQTT Record as an immutable object with a time stamp and checksum then sent straight to a database table at the host. 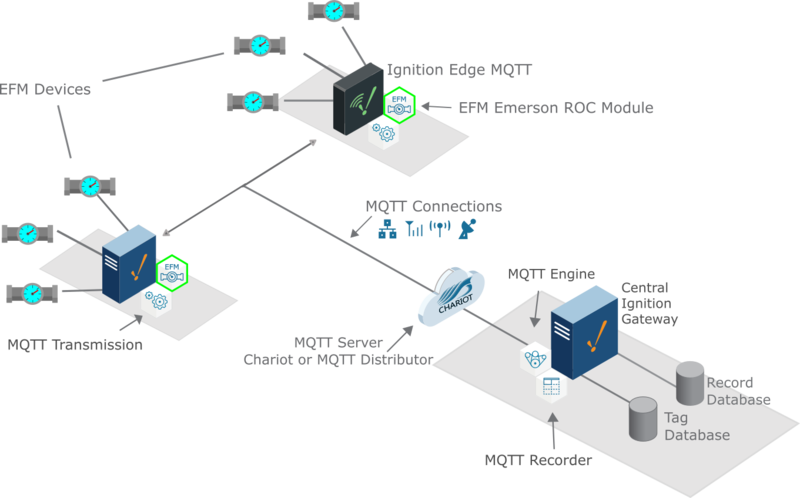 For delivering MQTT Records, the MQTT Recorder module is required. Please go here for more information on the MQTT Recorder Module. To find support and tutorials for the EFM Emerson ROC module, please go here.